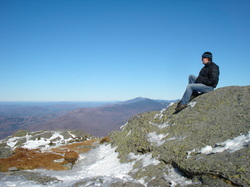 Interested in exploring Vermont's Winter Wilderness? We offer 1/2 day backcountry snowshoe trips of all ability levels. Snowshoes, poles, and instruction are provided on every trip. 3 hour tours are the norm...but we will customize a trip to any time or distance you want (price reflective of time.) We can take you to beautiful areas, with amazing views only minutes from the vehicle, or hike for miles through remote mountain terrain. Please see below for rates or contact us for more information.